ESTHER, THE JEWESS,was only a little girl when both her parents died and sh e went to live in the home of her cousin, Mordecai. Her new home was in the great city of Shushan, where the King of Persia lived. Her cousin, Mordecai, had an office in the household of the king. He was very kind to Esther, and loved her as his own child. 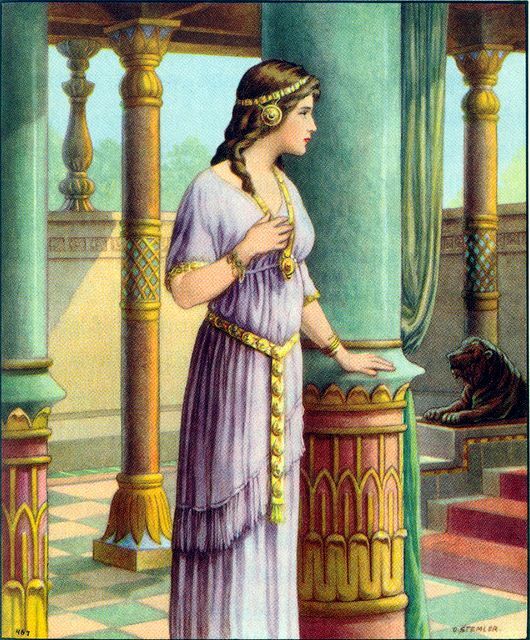 After Esther grew up to young womanhood the King of Persia made a great feast in his palace. He invited all the nobles and rulers of his kingdom. Then, at the last of the feast he invited all the men of Shushan, both great and small, to come to the palace and share in his entertainment. Perhaps mordecai was there, too. Women in that country always wore veils over their faces when in the presence of men other than their own husbands, and they could not attend the same feasts with them. So the Queen, Vashti, gave a feast to the women at the same time as the King’s feast to the men. On the last day of the feast, which continued for a whole week, the King grew very reckless because he had drunk much wine. And he wished to see his beautiful wife, the Queen. He wished that all the people attending his feast might see how beautiful she was. So he sent some of his servants to bring her into his part of the royal palace, where all the guest could behold her beauty. But Vashti, the Queen, refused to appear in the presence of all the men of Shushan. And she told the King’s servants that she would not come. She believed that the King’s request was unwise because it was contrary to the customs of her people. King Ahasuerus was very angry when the servants returned alone and told him that Vashti would not come with them. He called his wise men and asked what should be done with Vashti, the Queen, who had dared to disobey him. This advice pleased Ahasuerus, and he refused to let Vashti come into his presence again. He refused to let her be queen any longer, and decided to choose another beautiful young woman to become queen in her stead. So he sent commands through all his kingdom that the most beautiful young women should be brought to his palace, where he might choose among them the one who would please him best. This one he would make queen instead of Vashti. Mordecai knew that Esther was a beautiful young woman, and he believed she would make a beautiful queen. So he sent her to the palace with the other young women who came from different parts of the kingdom. And there she was taught the manners of the courtlife, so she would know how to please the King. But Mordecai told her not to let the fact become known that her people were the Jews. After living in the palace for some time, Esther was brought before the King; and she pleased him so much that he chose her at once to become the queen instead of Vashti. He placed the royal crown of Persia upon her head, and gave her rooms in his palace and many servants to attend her. Then he made a great feast for his princes and nobles, called Esther’s feast, and he published the fact that Esther had been chosen as the new queen. Mordecai could no longer see the young woman whom he had cared for as tenderly as his own daughter. But every day he passed by the palace where she lived, and she could see him from her window. She would send messages to him by her faithful servants, and they would bring back the messages Mordecai wished her to receive. Then Mordecai would return to the king’s gate and sit there as a watchman. While sitting in the gate, Mordecai saw two servants of the king who whispered together about some secret matter. He watched closely and learned that they were angry with the King and were planning to kill him. So he sent word to the King by Queen Esther, and she gave the warning in Mordecai’s name. The King investigated the matter, and found that the men were guilty, so he put them to death. Then the warning of Mordecai, and how he had saved the King’s life, were written in a book. But the King forgot about Mordecai’s kindness to him, and did not promote him in the kingdom. He did not know that Mordecai, the Jew, was a relative of the beautiful young woman who wore the royal crown. This entry was posted in Discipleship and tagged Ahasuerus, Christ Jesus, Christianity, Esther, God, Haman, Jesus Christ, Jew, King, Mordecai, Old Testament, Persia, theology, Vashti. Bookmark the permalink.